Another fabulous romantic suspense from Misty Evans! 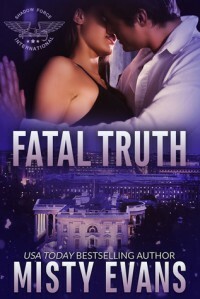 Fast moving and entertaining, with just enough romance and tension thrown in to keep me glued to the pages, Fatal Truth was a great start to a new series. Savannah ended up being an awesome heroine. I was a bit unsure of her at first, but as her character was developed and revealed throughout the book she really had everything I love in my heroines – she was strong, smart, capable, and knew when she needed to ask for help. Yet she also didn’t have a problem standing up for herself or letting her thoughts and opinions be heard – especially when it came to Trace. Trace has learned to keep everything under control, especially his emotions. Unfortunately when it comes to Savannah she always seems to get him a little bit crazy. And even though I was a bit frustrated that he didn’t man up and let Savannah know who he was, knowing his past made me a little more forgiving towards him. Together these two had some serious tension going on. And let’s just say at one point the term “hot yoga” had more to do with the heat between these two than the yoga challenge that they had going on. I loved the secondary characters in the book and each and every one of them added something to the story. I really loved seeing Cal, Beatrice, and Emit again – Beatrice was one of my favorite characters from the SCVC series and I love that I’ll get to see a bit more of her in this new spin-off series. If you’re looking for a great romantic suspense then look no further. Fatal Truth offers up a large dose of conspiracy, intrigue, and action, with a nice side of romance and shouldn’t be missed.